Amir Khusrow's couplet which translates as ' If there is paradise on earth, it is here,it is here,it is here' aptly describes the beauty of Kashmir valley. Kashmir always remain at the top of the list for those planning holidays. We have seen its mesmerizing beauty in various films of sixties and in some recent flicks like 3 idiots,Jab Tak Hai Jaan and soon to be released Haider. But the recent( Sep. 2014) flood in Kashmir the worst since independence has devastated the charm of that place. The flood due to torrential rain have affected both the sides of Kashmir(J & K and PoK ) filling the whole state with mud and silt. 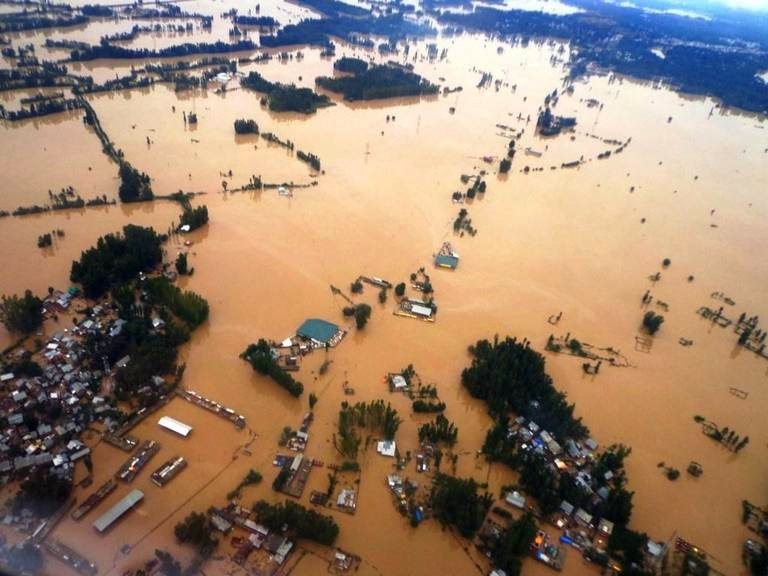 About 400 villages are completely submerged in flood water from 2000 villages that are affected by the flood making thousands homeless and killing around 200 people in J & K. Indian army's rescue operations have rescued around 25000 people till 9th September 2014. The question here is not about the rescue and relief operations both the central and state governments are trying their best in saving lives of people and to send relief materials to the stranded people. The army's efforts are also commendable without any doubts but what I like to ask is Do we learn from mistakes ? What's the role of meteorological department if they can't predict anything ? Why no preparations for flood conditions at state level ? What National Water Resources Council (NWRC) is doing for such situations? We have faced similar situations during flash floods of Uttrakhand last year, there also we have no predictions about such floods which consumed thousands of human lives. The new government has completed more than three months and still we don't have deputy chairman of NWRC (since chairman by default is PM ) which shows our negligence regarding floods. There are no flood warning system in J & K, the state government don't have boats to rescue people, meteorological department always fails to predict such disasters. It's the time that we better equip our Met department for better predictions, NWRC also required to act promptly in reviewing such conditions. There is always hue and cry during the disaster period but things went to cold storage once situation becomes normal which is the main reason why history repeats self. We as a nation always stood together to help each other during such natural calamities. The whole nation is praying for the people of J & K and helping them by donating relief materials and money. I hope situation will be normal soon in Kashmir and prays for well being of all those who are struck in remote places. May god help them in this tough time. The paradise which have lost will soon recover from the hell of rain. Ameen.